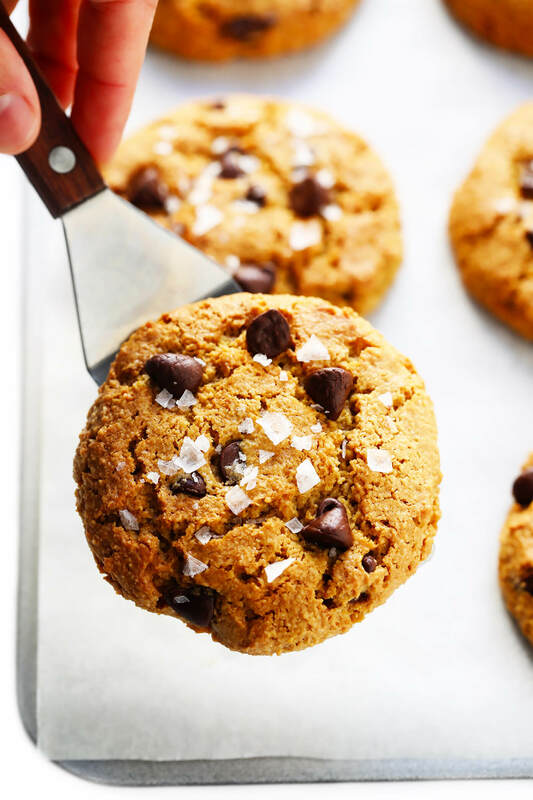 This healthier flourless chocolate chip cookie recipe is quick and easy to make, full of great flavor, and naturally (both) gluten-free and vegan. For all of you who have requested a gluten-free or vegan chocolate chip cookie recipe over the years, I have good news for you today. This chocolate chip recipe is both! These CCCs are super quick and easy to make in just one bowl (no mixer required). They are made with almond flour (which you can either buy store-bought or make yourself), making them naturally gluten-free. 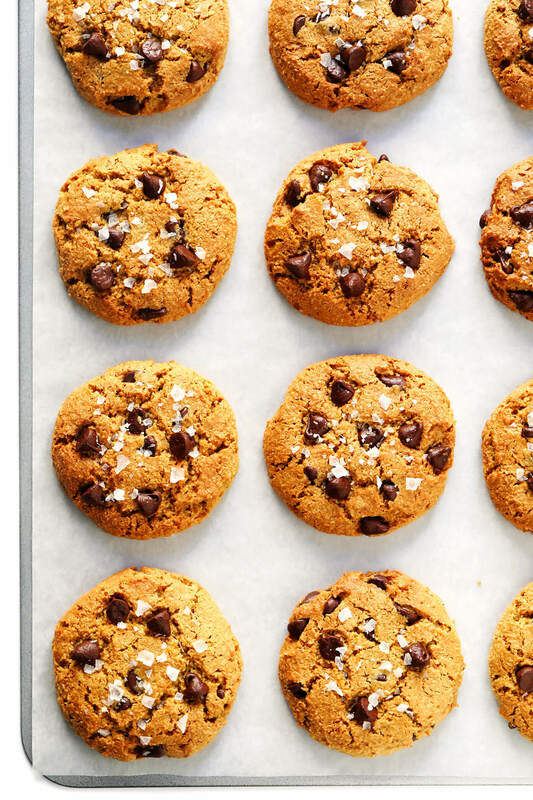 They can also be made with a flax egg or a regular egg, depending on whether you would like to make the cookies vegan. The recipe also contains impressively minimal oil and sweeteners. 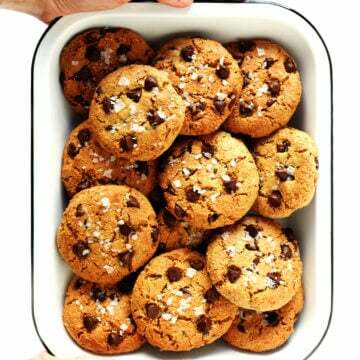 But I’m telling you, these easy chocolate chip cookies are just as chocolatey, sweet, and satisfying as ever! And the credit for them goes entirely to my good friends, Jeanine and Jack, of the blog Love & Lemons. This recipe was one of the very first that I made from their hot-off-the-press new cookbook, Love & Lemons Everyday (affiliate link). But judging by the zillion or so dog-eared pages in my book, it clearly won’t be the last. You guys, this book is such a gem. It’s full of Jeanine’s trademark beautiful, healthy, and legit-simple recipes, that are sure to bring some fresh inspiration to anyone’s kitchen. But I especially love this book because it is so dang helpful. Each chapter is chock-full of useful cooking and meal-planning tips, from exactly how to roast or grill each vegetable from A-Z, to how to use “scrap parts”, to how to pickle various veggies, to how to freeze herbs and quinoa, to fun variations for scrambled eggs and fruit crumbles and 5-ingredient salad dressings and so much more. This book is a wealth of cooking information and inspiration, and bonus, it’s beautiful design will look great on any countertop or coffee table. I wholeheartedly recommend that you check it out! Egg (or flax egg): I tested out batches both ways and both were delicious! Feel free to use a regular egg. Or if you would like to make these cookies vegan, make a flax egg by whisking together 1 tablespoon ground flaxseed and 3 tablespoons water. Coconut oil: Softened but not melted. Sugar: Jeanine recommends either coconut sugar or packed brown sugar. Almond butter: Or natural peanut butter would also work. 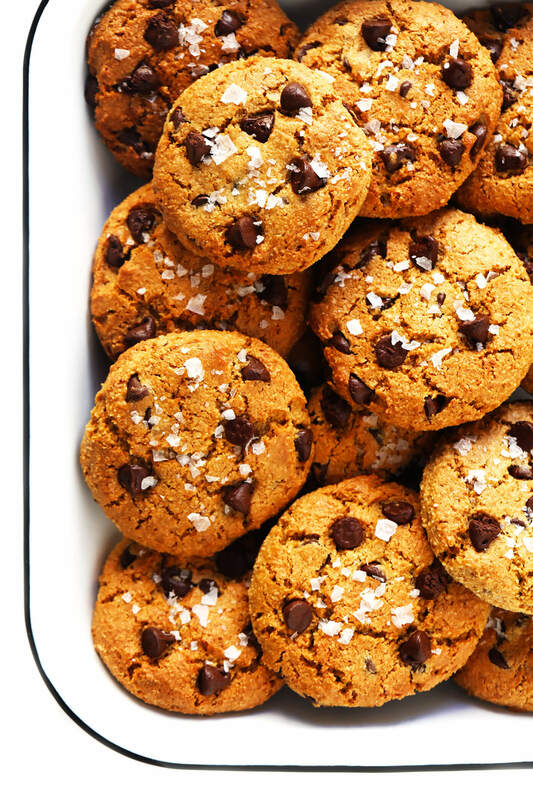 Vanilla extract, baking soda, sea salt: Because…cookies. Almond flour: You can either buy store-bought almond flour, or blitz a bunch of blanched almonds in a food processor until they’re light and powdery to make your own. Semisweet chocolate chips: If making these cookies vegan, be sure to use dairy-free chocolate chips. Whisk the wet ingredients and sugar together. Egg, oil, sugar, almond butter, and vanilla. Add the dry ingredients. Almond flour, baking soda and salt. Then fold in the chocolate chips. Form the dough balls. Jeanine made this recipe with a 2-tablespoon cookie scoop (which would create dough balls that need to bake for 10-13 minutes). But I only own a large 3-tablespoon cookie scoop, so I used that instead (which need to bake for about 11-14 minutes). Once you make the dough balls, be sure to press and flatten them down a bit with your fingers so that they cook evenly. My dough balls were about 1/2-inch thick. Then I also pressed a few extra chocolate chips on top of each dough ball, and sprinkled each with a pinch of flaky sea salt. Enjoy! My experience with almond-flour-based cookies is that they’re always best hot outta the oven. But that said, if you have leftovers, you can store them in an airtight container for up to 4 days or freeze for up to 4 months. Add nuts: Feel free to add in a small handful of chopped nuts (such as pecans, almonds, peanuts, etc.) if you would like. Use different chocolate chips: Dark chocolate chips, white chocolate chips, peanut butter chips or M&Ms would also be delicious here. Use different sugar: If you’re in a pinch and only have white granulated sugar on hand, that will also work in these cookies. Congrats on the new book, Jeanine and Jack! And happy baking, everyone! In a large bowl, add the egg (or flax egg), coconut oil, sugar, almond butter and vanilla. Whisk until well combined. Add the almond flour and sprinkle the baking soda and salt evenly over the mixture. Use a spatula or wooden spoon to stir until well combined, adding 1 to 2 tablespoons water is the mixture is too dry. Fold in the chocolate chips. Use a 3-tablespoon* cookie scoop to scoop the dough onto the baking sheet. Press each ball down slightly and sprinkle with flaky sea salt, if using. Bake for 11-14 minutes, or until the edges are just starting to brown. Cool on the pan for 5 minutes and then transfer to a wire rack to finish cooling. 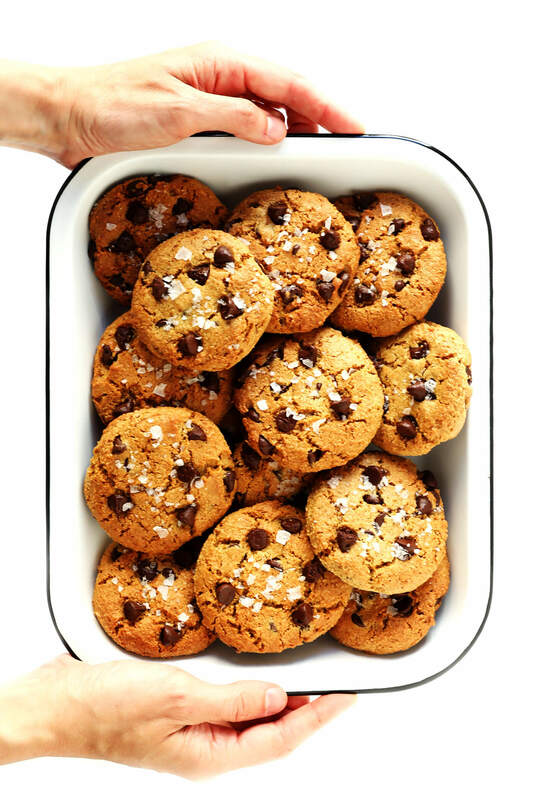 When the cookies are completely cool, they can be stored in an airtight container for up to 4 days or frozen for up to 4 months. *Flax Egg: To make 1 flax egg, whisk together 1 tablespoon ground flaxseed and 3 tablespoons water until combined. Let thicken for 5 minutes. Then continue on with the recipe. *Almond Flour: You can either purchase store-bought almond flour. Or just blitz blanched almonds for 1-2 minutes in the food processor until they are light and crumbly, to make your own almond flour. *Dough Ball Size: Jeanine wrote the recipe using a medium (2-tablespoon) cookie scoop, in which case the dough balls would need to bake for 10-13 minutes and would yield 16 cookies. I only own a large (3-tablespoon) cookie scoop, which requires that the dough bakes slightly longer and yields about 12 cookies. 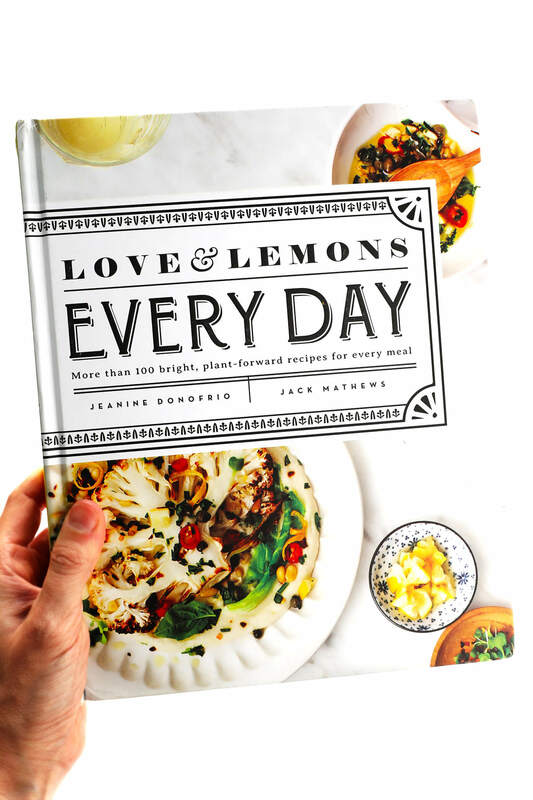 Recipe used with permission (and slightly edited) from Love & Lemons Everyday: More Than 100 Bright, Plant-Forward Recipes For Every Meal by Jeanine Donofrio and Jack Mathews.